The Lower Klamath is located in the northwest corner of California, about 2 hours east of Eureka off of Hwy 96. 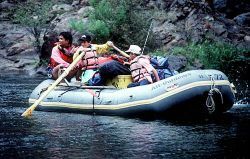 The Lower Klamath is one of the most scenic whitewater rafting trips in California. Fun Class II - III rapids are interspersed between calm warm pools; excellent for swimming. Take your time and enjoy the many side hikes the river has to offer with beautiful cascading waterfalls and Gold Rush history.